Are you participating in the Back-to-School Challenge? This is a great week to pick up some super cheap school supplies on your list. Here’s a look at the best deals I see this week. Many of the office supply stores are running their deals regionally this summer. They are staggering sales depending on when certain regions head back to school. The sales I post are based on the Kansas City paper, so be sure to check your circulars before heading out the door. ** Check your newspapers as mine came with a brown bag “special” – 20% off anything you can fit in the bag, plus all case paper, furniture, storage, and printer accessories. Did you see any great deals that I missed? Please leave a comment so I can update my list. Note: This is not every sale item this week, rather the ones I thought were most notable. 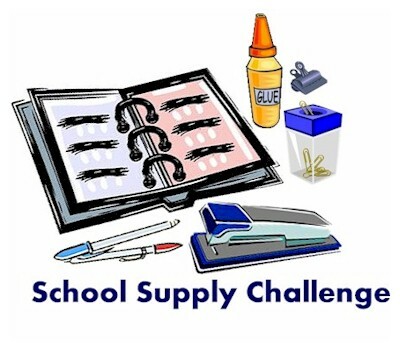 Don’t forget to stop by the School Supply Challenge Check-In! Your suggestion to price match at Target and then use a Target Q won’t work. They consider the price after their TQ to be their “sale price”, so when you go to customer service after completing your transaction they’ll tell you your Target price was better than the match price. You have to choose the price match or the TQ. You can still put a MQ after the match. $1 for the bigger plastic pencil boxes. The smaller ones were 50c last week, but they don’t fit all the stuff well. DD’s been asking for a big one and now that it’s on sale, I’ll probably indulge. $3 for a 10 pack of poster boards. We no doubt have many more posters in our future, so 30c/board sounds like a good investment. Those poster boards were a smidge cheaper this past week at Wags, but you’re right, it’s not a huge different ($.03 each). And I hear you on the bigger boxes. Fortunately we don’t need those yet on our list!